Prison institutions are one of the three main constituents of the Crimal Justice System and the other two being the Police department and the Judiciary. A comprehensive study is to be done about these three institutions with a key focus on the rehabilitation of prisoners. Prison is defined as a place in which a person is kept in captivity or confinement as a result of legal process. Prison and it administration is a state subject in India as directed by item 4 under list 11, schedule VII in the Constitution of India. Prison institutions are ruled by the prison Rules of the each state and under the control of State Government.Prison is a very complex system and the working inside prison should be very much systematic and effective. Otherwise it will be like a drop in the ocean. We may not able to cover all the prisoners and their needs.There should be always follow up of whatever we do in the prisons. Unless we keep records of everything it is just impossible to trace a prisoner in the crowd. 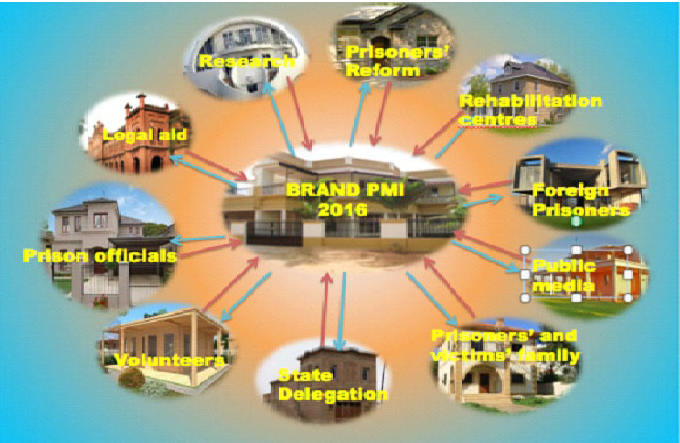 As each state is independent in its administration it is very much needed to coordinate the work of prison ministry in different departments. So that each need can be categorized under certain department and can be channelized to concerned people of the department under various levels. Evaluation of the functioning of the other departments. Prepare the materials for the awareness classes and arrange the training programs. Training for the prison officials..
Increase the rapport with prison officials.. Maintain the relationship between prison officials and volunteers. To develop special pattern for rehabilitation centre..
Financial, legal and moral support to the rehabilitation centre.. Formation for the director and staff of the rehabilitation centre. Conduct training programme for the inmates . Make the good relationship with embassy’s of the different countries. .
Help the Indian nationals in foreign prisoners..
Make more publication about PMI through modern media . Taking care of the monthly news bulletin. Family visits (both victims and offenders). Educational help to victim’s and offender’s children. Arrange training programs for volunteers..
Form a team of delegates for various states. Conduct training programme for the national delegates. Make regular visits to the states. Make them aware that they are the mediator of state and national office.